● “EW” = Lunsford, Andrea. The Everyday Writer. Boston: Bedford/St. Martin’s. 4th edition, 2009. Customized for Florida International University. 2) What is your writing process or how do you normally write your papers? 3) What classes are you taking this semester? (5 min): Each group-write down (on one piece of paper) the first & last names of individuals in each group and turn in one paper with four names to the instructor. Instructor should post Unit Groups in Moodle. (5 min): Tell students there will be quizzes throughout the semester to hold them accountable for reading. (15 min): Discuss Logos, Ethos, and Pathos. Have the students come up with examples of how to use each appeal in their own writing. (10 min): Hand out “The Naturalization” (Trevino Lit. Narrative example) and read the first few paragraphs and discuss the way Trevino opens the narrative. (5 min): In-class writing–Have the students free write about a time when reading, writing, or language impacted them. Point out that it doesn’t have to be a life-changing event, just something they remember having an effect on their personal experience with reading, writing, or language. (5 min): Explain homework: read articles for next week. Have the students keep in mind their own experiences while reading. (15 min): Class discussion–define Literacy, define Narrative, define Autobiographical. ○ When considering the audience the pathos is what you use to draw them in. ○ This will count as your attendance for this class period. ○ Turn in a hard copy with all group members names. (15 Minutes): Concrete and Figurative Language Definitions. ● Break into Groups of Three and have them read over each others Literacy Narratives. ● Have 2-3 Groups read their discussions aloud. ● This Free Write will be your attendance grade for the class period. bring a hard copy to class on Monday. ● What were Tan’s main points about literacy? ● How might Tan define literacy? ● In your groups of 3-4, pick moments for explosion in your code switching logs. Explode them! ● Students who did not turn one in can now start it in class. ● What is the purpose of the Writer’s Memo? ● How can you assess the rhetorical situation? ● How does it help? ● What’s the difference between revision and editing? ● What’s the difference between local and global revisions? ● Write a story about dinner last night using memory-soaked words. ● Remember to bring 2 copies of your literacy narrative and the peer response sheet! ● What concepts from the past few weeks do you need to consider while reviewing your peer’s literacy narratives? ● Which do you need to consider while revising your own literacy narrative? title, banana/scale of abstraction, audience and writing for the rubric. ● What did your peers help you learn about audience? Homework for next: Prepare two hard copies for use in-class on Monday. Class Goals: the students will develop a basic understanding of the manner in which an autobiographical essay is written. They will review the following aspects of such a paper: rhetorical purpose, audience, how to avoid chronological writing, author’s voice, using imagery to describe a scene. Students will also be introduced to the logic behind the rubric. What is the grader looking for in the student’s essay? ● Lecture: What is an autobiographical essay? ● What is author’s voice? ● Homework for next time: Bring a hard copy of your literacy narrative. 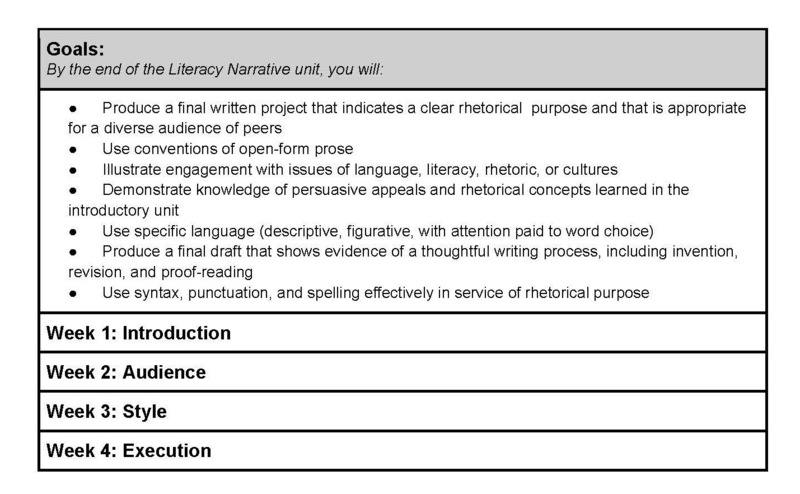 Outcomes: the students should understand what the grader will be looking for in the final draft of the literacy narrative. Outcomes: the students should leave the session with a good idea of what needs to be changed in their papers in order to satisfy the rubric’s parameters. Class Goals: a review of the sources employed by ENC-1101 students in order to check their work for common grammatical errors. Also, students will review the use of Moodle and Turnitin.com in their efforts to check their comments and grades on-line. Outcomes: the students should have a better grasp on the editing process. They should also be familiar with the learning aids meant to assist them in this process.